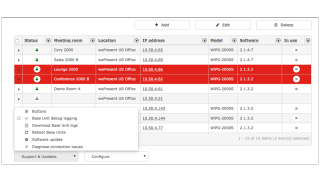 The What: wePresent has announced its new Collaborative Management Suite, giving IT department employees a tool to remotely manage the wePresent systems on their network. The CMGS platform is best used for enterprise-wide and other large deployments to allow for mass monitoring. The What Else: CMGS is a server-based utility that allows network-integrated management of wePresent hardware. Once installed, it will allow administrators to schedule firmware updates, change the configuration of individual units, or remotely troubleshoot problems with the hardware. The Bottom Line: Best suited for large networks, such as schools or office buildings, CMGS is intended to address the growing need for remote hardware management, easing the workload of IT administrators who oversee an abundance of devices.